If you’re living in Charlotte (Mecklenburg County) or you are just passing through, you never know when you might need the services of a personal injury lawyer. Now, if you've been talking with some friends over dinner or colleagues near the water cooler, it’s highly possible that you’ve been getting a negative idea about the whole concept of suing for personal injuries. But the truth is you’re probably thinking that just because you haven’t been on the receiving end of a personal injury situation yet. In today’s tough economic times most people are having to tighten their belts a bit more. With the rising cost of health care even a small personal injury might set you back thousands of dollars. In this day and age, anything that lays you up for more than a few days or results in long terms physical problems must be addressed, and monetary compensation should be sought. For example: If you have been involved in a car accident in North Carolina, and you've been injured enough that you’re looking at a few weeks of recovery, or lingering damage that can make your quality of life lower, then of course you would be filled with stress and anxiety. It’s like having the car accident version of post-traumatic stress disorder (and in some cases, this is exactly what is happening). You worry about your family, your health, your car, your job, and how you’ll have to deal with all these in the future. It’s a horrible thing to think about, knowing that one accident can put your whole life up in the air. A personal injury attorney can help put your life back on an even course, by guiding you through you medical care, the maze of legal options, and securing compensation for your injuries. 1) Is the lawyer asking the right questions? If the lawyer quizzing you about the details of the accident, double-checking all the facts, and making sure that he or she knows just as much about your medical condition as you do, then this is a sign that you have the right lawyer. After all, the best cases are based on facts that can show the judge and jury that you need compensation. If they just keep on telling you that everything will be all right, that you don’t have to worry about a thing, then you should get worried. The attorney’s job is to make sure you get properly compensated for the disruption in your life that the accident or situation may have caused. 2) Are they talking to you personally? Many firms send associates, paralegals or administrative assistance to talk with you about your case. The only way for your attorney to truly understand what you are going through is to deal with you personally. If your lawyer isn't getting in touch with you as much as he or she should, then it’s time to look for another law firm. It’s important that your lawyer have the same amount of psychological and emotional investment in the case that you do. That can only happen if they are talking to you, so they can see how important it is to you, as well. 3) Do they know what they are doing? Remember, North Carolina has unique and complex laws on personal injury, which are always changing. Further, each jurisdiction has its own local rules. For example a Charlotte car accident case filed in Mecklenburg County needs to be handled differently that the same type of car accident in Gastonia. When it comes to personal injury your lawyer is not the only one who should be properly prepared and educated. Part of successfully building your case means that you have to become educated on how insurance companies think and work. While it may be traumatic for many people, it is important to try and remember what happened from your point of view during the accident or situation that led to your personal injury claim. If necessary, you should take down your own notes, so you can at least refer to them while meeting with our attorney. You can even submit to your lawyer your written recollections, so that he or she can review it and ask you clarifying questions, and thus help you have a truthful and as accurate as possible retelling of the situation from your point of view. Bring with you as much documentation as possible to your meeting with the attorney. Many times people will have their discharge records from the hospital, police report, pictures, or letters they have received from the insurance company. All too often our personal injury lawyers receive a phone call from a prospective client who was involved in a Charlotte car accident but haven’t treated since they are waiting to hear back from the insurance company. Unfortunately the longer you wait to treat following an accident the harder it becomes to get you compensation. This is particularly important if you live and are injured in Charlotte or Mecklenburg County where juries can be very conservative and don’t like gaps in treatment. 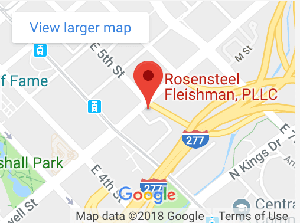 At Rosensteel Fleishman, PLLC our Charlotte personal injury lawyers handle every aspect of your car accident (or other personal injury) from start to finish. Our lawyers have handled personal injury cases all over North Carolina and are regularly brought in to assist other lawyers with their client’s cases. It is not without a small amount of pride that we continue to serve thousands of people across NC despite the fact that we have never advertised our services via TV, radio or send letters to people’s houses. There is no fee to speak with one of our Charlotte personal injury lawyers. We handle car accidents in Charlotte, Gastonia Concord and across North Carolina. Please feel free to contact us to discuss your case.